A member of the Iraqi Counter Terrorism Service fires his weapon at Islamic State militants in the al-Zahraa neighborhood of Mosul, Iraq, Nov. 13, 2016. The Iraqi military announced Sunday that its forces captured the ancient city of Nimrud. The Iraqi military says it has captured the city of Nimrud from Islamic State militants. Iraq's Joint Operations Command says "the 9th division of the Iraqi army has liberated the town of Nimrud completely and raised the Iraqi flag over its buildings after the enemy suffered heavy casualties." Nimrud is near an ancient Assyrian capital that the Iraqi government said last year was destroyed by militants. It was not immediately known if the military had retaken the archaeological site. 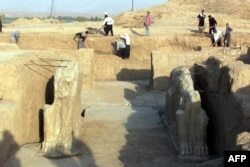 FILE - Iraqi workers in 2001 clean an archeological site in Nimrud. The Islamic State group has bulldozed the ancient Assyrian city, Iraq's government says, March 5, 2015. Nimrud is 30 kilometers south of Mosul, where Iraqi soldiers and special forces are battling Islamic State for control. The operation is part of a campaign between Iraqi government and allied forces to drive militants away from Mosul and its neighboring cities held by Sunni Islamist groups. Although the government has assembled at least 100,000 troops, commanders say the fight may be long. “Our approach [to Hadba] will be very slow and cautious so that we can reach the families and free them from Daesh’s [Islamic State] grip,” Brigadier Ali Abdulla said. The Norwegian Refugee Council said Sunday more than 50,000 people have been forced from their homes. The organization says at least 700,000 people will need shelter, food, water and medical support.